Purafish is used as a liquid fertilizer to improve soil fertility and plant growth and has been used for centuries throughout the world. 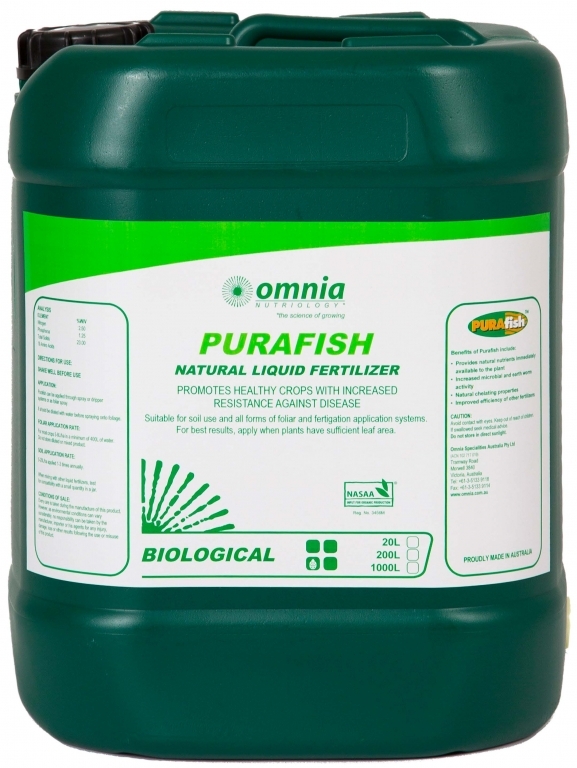 Omnia Specialities Australia’s Purafish is a natural balanced liquid fish fertilizer that has been manufactured using a low temperature, natural enzyme process to preserve the nutritional value of the protein and essential nutrients. Purafish, being totally derived from organic sources, contains amino acids and minerals in natural form that are much more readily available to plants. The nitrogen is in the form of peptides and amino acids, which slowly break down when added to soils, thereby reducing leaching losses and increasing nitrogen availability to plants over a longer period of time. Purafish is suitable for fertigation, mister, boom spray and trickle irrigation systems or as a foliar spray because of its superfine particle size and optimum oil content. It should be diluted with water before spraying onto foliage. Application rate for most crops is 5 to 8 litres per hectare diluted with a minimum of 400 litres of water. 5-20 litres per hectare applied 1-3 times annually. Purafish is a NASAA-Certified organic product of choice.